On 15 February, the very first edition of Offshore Seminar took place at the Mainport Hotel in Rotterdam. The topic of the event was ‘Evolving Energy Through Innovation’. 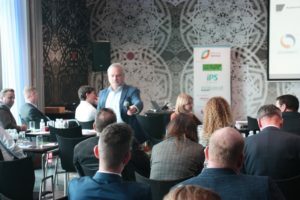 Offshore professionals, from the Netherlands, Germany and the UK, gathered to discuss the future of the Dutch North Sea and the role for innovation in the energy transition. In the morning experienced speakers Richard Brakenhoff from Rabobank, Joep Athmer from Van Oord Offshore and sustainable energy consultant Frans Debets discussed where the Netherlands are at the moment in the energy transition and what needs to be done to ensure that the Netherlands will comply to the Climate Act target and in a most cost-effective manner. After lunch, Martin Weissmann from Offshore Wind Innovators explained that half of the innovations in offshore wind concentrate on information technology. The three following speakers, Dutch innovative companies ECE Offshore, MO4 and Next Ocean each provided an example of the data collection and processing tools they developed for wave prediction, motion forecasting and cable monitoring, respectively. Wouter de Zeeuw of ECE Offshore shared with the audience for the first time their latest news that they were granted a new project. The last two sessions of the day concentrated on combining fossil and renewable energies and one of the key challenges in the energy transition; energy storage. Julius Ansenk of NAM and Jaco Fleumer of HMS Offshore elaborated on the unmanned L13-FI platform whereby the energy use is provided by solar panels and wind turbines. Martijn Beerthuizen of Sophisticated Systems introduced their solution for energy storage. The next edition of Offshore Seminar will take place on Thursday 14 February 2019. More details will become available on the event’s website in due time.